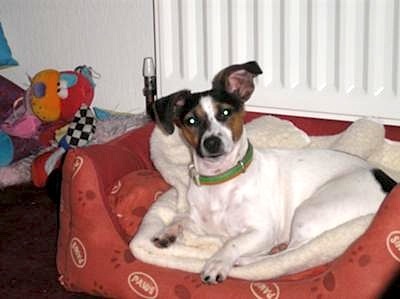 Sophie is a 1 year old miniature Jack Russell, full of fun and full of mischief. She gives us hours of fun watching her chasing her tail and digging imaginary holes in the carpet. She thinks she is human, every time I go into my bedroom, there she is in the bed under the covers with her head on the pillow. Sophie loves to snuggle up and keeps you warm on those cold winter nights.